Stampede Reservoir is one of California’s most consistent kokanee fisheries every year. On the other hand, it hasn’t had large kokanee for three years. Fortunately, this year the kokanee are larger than they’ve been in previous years. It’s just a cycle and this summer has been on the upswing. Fishing has been good all summer and the better news is Stampede will fish well for a few more weeks. The bite should last into late September. Limits have been common all season. There’s been 15-30 boats on the lake each day, which is what I expect this weekend. If you are fishing this weekend it’s best to get here super early as the recreation boaters will be out in force. There’s reason to make the trip. An average kokanee has been about 16-17 inches. On the other hand we’ve caught them to 18 inches. I had one on the other day that was larger than 18 inches, but we lost it at the net. I’m expecting for some fish to 19 inches to be caught this weekend. There has to be some shallow water with big fish in it. For the most part we are fishing at the dam in deep water. There’s fish from 50-100 feet deep, but our more consistent bite has been from 70 to 90 feet down. It would blow your mind if I were able to show you a photo of the graph. The kokanee look like snakes because there’s so many on the fish finder, especially in the morning before the sun comes up. The bite has been best from first light until 10am. My best day was 20 fish on the trailer by 8am. Prior to the sun hitting the water we are using a lot of glow in the dark stuff and some glow in the dark spinners. When the sun hits the water we switch to purples, blues and greens and stay with that throughout the day. I’m running 8-pound P-Line mainline and 10-pound P-Line leaders because the males have teeth. If you use lighter line the teeth will cut through it. My best rig this season has been a 4.25 or 5.5 Rocky Mountain Bahama Mamma dodger with a Purple Apex, Uncle Larry’s Mad Irishman spinner or a pink micro hoochie. I’ve been tipping all my baits with mostly Natural Fire Corn, but pink and red corn has been working, too. Editor’s Note: Troy Barr operates T-Roy’s Guide Service. 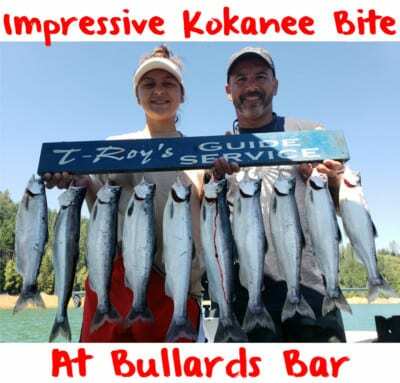 For more info on his guided kokanee trips please visit http://www.fisht-roys.com.